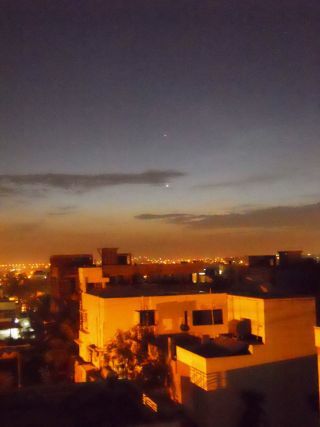 Astrophotographer Srinath Sonar sent in a photo of Mercury and Venus taken just after sunset in Bangalore, India, on June 5, 2013. Stargazers will get an interesting chance to see a celestial configuration between the moon and two bright planets on Monday (June 10) evening. Looking low toward the west-northwest horizon, you’ll first notice the skinny lunar crescent, just 5 percent illuminated and just a little more than two days past new phase. Next, look about 9 degrees to the right of the crescent and you’ll pick out the brighter of the two planets, Venus. Nine degrees is a rather wide gap and is nearly equivalent to the width of your fist held out at arm’s length. Look roughly midway between the moon and Venus for Mercury, the innermost planet to the sun. Venus displays itself rather modestly in the western twilight after sunset this month. Earth's sister planet remains just above the west-northwest horizon after sundown, setting during twilight, so you’ll have to look early, preferably with binoculars. It is so bright that it can be spotted even through the twilight glow 45 minutes after sunset. But Venus is beginning the kind of evening appearance that tries our patience. It won’t get much higher and more easily visible until autumn. The planet won't set in total darkness until after the first week in September. In a telescope, silvery Venus is also rather disappointing. Its disk appears quite small and is almost fully lit. Venus and Mercury will be engaged in an interesting dance with each other during the next 10 days. Currently, Mercury stands about 5 degrees above and to the left of Venus, but by June 16 the distance between the two planets will be down to 3 degrees. On June 18 the two planets will appear side by side and only about 2.5 degrees apart, Venus on the right, Mercury, much fainter on the left. By June 21, fading Mercury will slide below and to the left of Venus, ultimately disappearing into the bright sunset glow, but Venus will continue to maintain its presence in the evening sky for the rest of this year. Editor's note:If you snap an amazing picture of this celestial sight or any other night sky view that you'd like to share for a possible story or image gallery, send photos, comments and your name and location to Managing Editor Tariq Malik at spacephotos@space.com. Joe Rao serves as an instructor and guest lecturer at New York's Hayden Planetarium. He writes about astronomy for Natural History magazine, the Farmer's Almanac and other publications, and he is also an on-camera meteorologist for News 12 Westchester, New York. Follow us on Twitter, Facebook and Google+. Original article on SPACE.com.